"Chess Movies" represents a new idea in the Pandolfini Chess Library series. It offers instructional material with every single move diagrammed and explained. Thus a chessboard and pieces are not needed to follow through. This makes it possible to rely solely on the book itself, as one would with a text on tactics and problems, without having to set up the positions. It's almost as if one is sitting in a movie theater, watching the film roll by, with the narrative carried along by subtitles. But whereas a film seen in the theater just keeps going, here you can "stop" the action and take time thinking about what you're seeing and what's being explained to you, as if you were home watching on your own DVD. 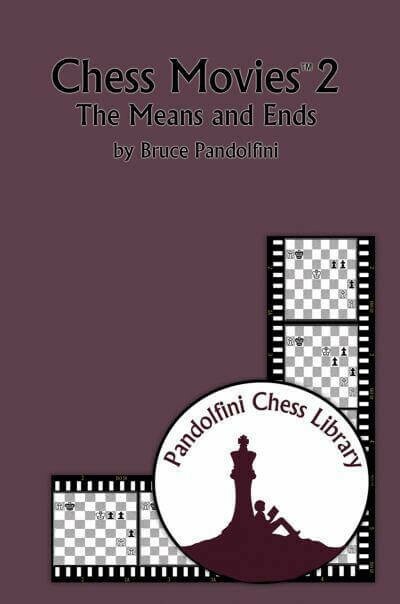 In this second volume of the Chess Movies series, The Means and Ends, the enthusiast is presented with an assortment of 50 precisely finessed and well-executed endgames from the oeuvres of the world's foremost chess gladiators. Lasker, Rubinstein, Capablanca, Karpov, Fischer, Anand and other chess gods, offered in stratagem, maneuver, and insightful simplification, provide the subject matter for this newest collection of chess cinema. Taking off from volume 1 of the Chess Movies series, the present volume shows the other end of successful chess play, the actual final moves of winning endgames. Read and watch on, and may all of you play happily ever after. Chess Master Bruce Pandolfini has been one of the most popular chess writers in the world for more than four decades. He has written on all aspects of the game and is alos considered one of the premier chess instructors in the United States.